On 21st March 1918, the German Seventeenth, Second and Eighteenth Armies were launched against the British lines on a 54-mile (86km) front from Arras to la Fère. In a bold attempt to punch through the lines and to drive the British armies north to the Channel, the Germans threw 500,000 troops against 160,000 men of the right wing of the British 3rd Army and the British 5th Army. Above left: 2/Lt. 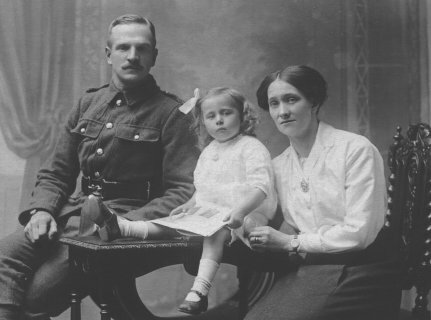 Basil Arthur Horsfall VC Above right: Albert Walton, with his wife, Edith Charlotte, and daughter, Irene. 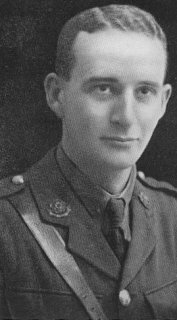 Albert was from Nelson and was wounded in action with the 11th East Lancashires at Ayette on 27th March 1918. Photograph by kind courtesy of Albert's grandson, David Holman. Although the 3rd Army stood its ground well, the attack to the south forced the overstretched 5th Army to concede up to 4.5 miles (7km) of ground on the first day of the offensive; 21,000 British troops were taken prisoner. Despite intensely-fought rearguard actions, the 5th Army was compelled to fall back day after day. Within 48 hours, the Germans had thrown 750,000 men into the battle. The 3rd Army, which continued to withstand the onslaught, was forced to drop back to safeguard its right flank as the 5th Army retreated. Five French divisions were brought in to reinforce the southern end of the line on 23rd March; still the retreat continued. On 25th March, the 5th Army was pushed back across the 1916 Somme battlefield. The following day saw Albert fall to the enemy but, on the 27th, the 5th Army finally held its line. The 11th East Lancashires took no further part in the first German offensive of 1918. Strong German attacks on the 3rd Army front on 28th March were repelled, and on 5th April Ludendorff called off the Somme offensive. Four days later, the Germans would attempt a fresh breakthrough on a 10-mile (16km) front to the north: the Battle of the Lys would again see the 11th East Lancashires in the front line. A convenient route to the battlefield is to leave the N37 Arras to Bapaume road at Ervillers, following signs to the nearby village of Courcelles-le-Comte. On reaching the village, turn left into the main road towards Bucquoy. Near the end of the village, turn right down a minor road signposted to Ayette. The road initially curves downhill before climbing up the low ridge held by 92nd Brigade on 27th March. At the crest of the ridge, park close to where the road intersects a track. This is roughly where the forward positions of the 11th East Lancashires and the 11th East Yorkshires met. A fine panorama of the battlefield can be seen by walking some 50 yards along the track to the south-west, close to the point where 2/Lt. Horsfall's platoon fought so valiantly. The road can be followed on to Ayette, from where Serre is only 5 miles away along the D919. The idea of creating a memorial to Basil Arthur Horsfall VC in the village of Ablainzevelle was that of Christophe Gueant, vice-president of the Somme Remembrance Association. With the support of the commune, the memorial was constructed and placed close to the village war memorial. Christophe was able to contact members of the Horsfall family, twenty-two of whom travelled to attend the unveiling ceremony on 30th March 2019. In a separate ceremony on the same day, the village primary school was named after Horsfall. 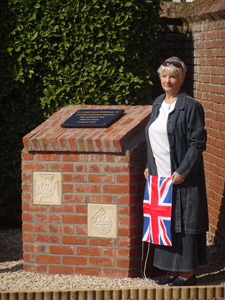 Right: Unveiling of the memorial by a great-niece of Basil Arthur Horsfall, 30th March 2019. Compiled from TNA documents WO95/2356, WO95/2357, WO95/2358, WO95/2366 and WO339/45724, CWGC records, and "The History of the East Lancashire Regiment in the Great War" edited by Major General Sir N. Nicholson.